External Modules let us add all sorts of functionality to Sitemagic CMS - for instance Google Maps, Videos, Social Media Plugins, and more. Technically an external module is just an iFrame that brings functionality from another website into your website, and it works really well. First make sure you are logged in, and that the extension External Modules have been enabled. Now go to Admin > External Modules. This will reveal the settings for External Modules. The Saved modules menu lets us edit modules that we have already created. The additional fields are used to create or edit an External Module. Let's briefly go over the fields. In Module name we can enter anything we want - this is the title of our module. The URL address / iFrame code field is where we enter either a URL or iFrame code. This will be covered in greater depth later. Width and Height lets us set the dimensions of our module. We can set Use scroll to either allow or disallow scrolling within the module. Show frame lets us set a frame border. Reload scrolls up instructs the module to scroll to the top if navigation takes place within the module. 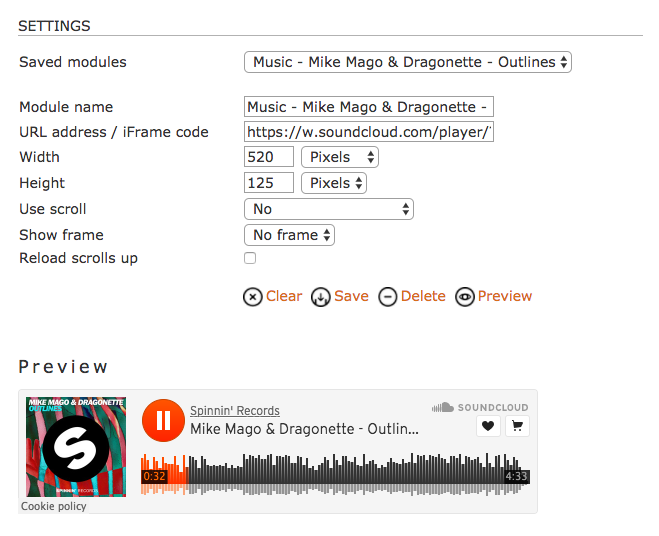 In the example below, we have opened settings for a module using SoundCloud to integrate music into our website. The Preview button allows us to immediately load the module to see what it looks like. All External Modules are turned into Page Extensions and can therefore easily be inserted into a page. Take a look at the menu - we have gathered a few examples of how to integrate YouTube, Vimeo, Google Maps, Facebook, and SoundCloud.